For the third year in a row, Marie-Caroline Dutton-Godart is organizing The Big Bazaar for The Children’s, benefiting The Montreal Children’s Hospital. The soon-to-be 16 year old St-Dorothy resident has experienced some difficult times in her young life. 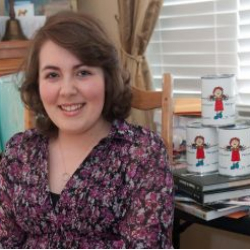 In 2007, she was diagnosed with a recurring malignant brain tumour, forcing her to take a leave from school. Radiotherapy, surgery and chemotherapy quickly followed. Marie-Caroline therefore knows all about what it’s like to live in the hospital. “During the summer of 2008, I developed an infection at the site of my tumour and I spent six weeks in the oncology ward,” she says. It was during this extended stay that the teen noticed a clear need for new equipment and materials that could provide much needed privacy for patients and parents. “There was only one bathroom on the floor where I was being treated and it was hard for parents to stay the night,” she explains. Marie-Caroline adds that she felt the ward also lacked some necessary supplies and equipment. “After my operation, I was told to use baby shampoo. I noticed there wasn’t any left, so my parents and I decided to bring a few bottles.” She believes that this lack of supplies and equipment is not limited to the floor where she received care. A full year after her experience, Marie-Caroline began thinking of organizing a bazaar. “You can find a lot of old things around the house that are still in working condition. I told myself that we could use these items to benefit the hospital,” she recalls. That first year, friends and family joined together to organize a garage sale in front of her family home. The event helped raise $ 5, 600. In 2010, while fulfilling her duties as ambassador for Pedal For Kids, she organized a second garage sale and collected $ 4, 600. “This year, we’re calling it a bazaar instead of a garage sale because we’re selling items that are practically brand new. The event will be bigger. About thirty volunteers will be helping us and we are hoping to exceed the amounts raised at previous events,” she explains. The 2011 edition will incorporate new additions, with collaborations from local artisans. “We will be showcasing a great deal of crafts. We will not be charging rates to set up kiosks to encourage artisans to display their crafts, and in exchange, they we will be giving us a portion of their revenues." Children's toys, books, CDs, DVDs, clothing, furniture, appliances and dishes, are just a sampling of the items that will be sold from the parking lot of l’école Trois-Soleils, which has been reserved for the event. For this mature teen, it’s important to give back; a gesture that is also greatly appreciated by hospital employees. “They are really happy. They also tell me that my gifts won’t only help others, but will help me too,” she concludes. All proceeds from the bazaar will go to the department of neurosurgery and neuro-oncology of The Montreal Children’s Hospital. The event will take place at 1295, chemin du Bord-de-l'Eau, on May 21st, 2011, or May 22nd in case of rain. All individuals wishing to make donations of household items, still in good condition can do so as early as 3 weeks before the event. For more information, please send an email to mcdg@hotmail.ca.